The Learnist iPhone, iPod Touch, and iPad app covers news, lifestyle, and general interest articles in a cool, exciting interface. It introduces you to complex stories with a table of contents. You can dig into the layers of a story piece by piece. The excellent photography and curated content round out this digital magazine. 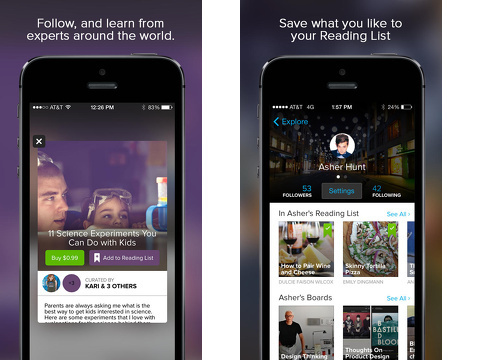 The Learnist iPhone app is a free download from the iTunes App Store, but premium content may be purchased. The Learnist iPhone app gives you three options to establish an account. The Facebook button is the largest on the screen, and the email and Twitter icons are smaller. It is safe to infer that Facebook is the preferred method. The Facebook authorization requires access to basic profile, list of friends, and photos. The distinctive features of the Learnist feed are excellent photography and smart organization. A larger photo with a title and provider name rests at the top of the feed. Several featured articles automatically pass through this area. Below the features, you find additional suggested categories with thumbnails and titles. You scroll horizontally through these thumbnails. Below the categories with thumbnails, you find a list of the categories. For each category, a new feed opens that is arranged like the home feed. The article interface is both visually engaging and easily navigated. Articles are referred to in Learnist as “boards.” This term reflects the commitment to telling a full story – not just a sound bite. The story’s photo expands, and the theme of the article is shared. The name and photo of the curator is available. You scroll vertically to reveal the table of contents. The back button is found in the upper left corner, and the share icon is in the upper right corner. As you touch a chapter from the table of contents, you dig deeper into the excellent content. A striking photo from the source material fills the top of the screen and a summary follows. You tap the “read full article” to open the source material within Learnist. You may open a YouTube video, a website, a map, or any pertinent information from the web. The interface is seamless despite the challenge of pulling information from a variety of web sources. The high quality of the content will lead you to follow favorite curators. The profile interface for curators is a nice blend of Pinterest and Twitter. The number of followers and following is listed. You can also see the boards a curator adds to his or her reading list, as well as the boards a curator makes. The Learnist iPhone, iPod Touch, and iPad app is an engaging experience for people who want to know the whole story – not just the highlights. 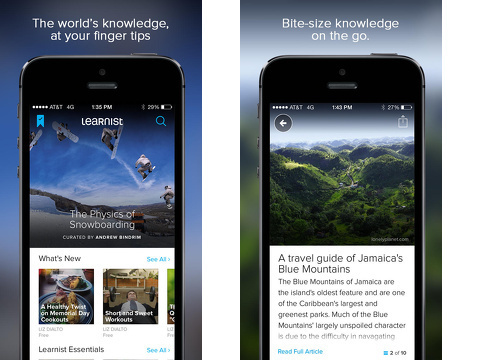 AppSafari review of Learnist: The World’s Knowledge At Your Fingertips was written by Jenni Ward on March 19th, 2014 and categorized under App Store, Education, Free, Fun, iPad apps, Productivity, Reference, Social, Universal. Page viewed 4894 times, 1 so far today. Need help on using these apps? Please read the Help Page. I wish to download other apps.